On the 200th anniversary of the birth of Charles darwin and the 150th celebration of the publication of his Origin of the Species, subjects believed to be members of the British species expressed some interesting views on the beginnings of life on earth. 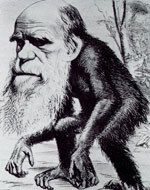 Fifty per cent of Britons polled rejected the theory of evolution. The most common and vociferous objection seemed to come down to the belief that one's uncle could not have been a monkey. A significant minority did acknowledge a close relative to be a jackass. The other fifty per cent in the survey were more or less convinced that a lion named Aslan was the creator of the universe and that he would some day return to restore the British Empire to its rightful place as Tea Merchant of the world.